Learn how i GET IT and Tata Technologies can solve some of the most common training problems customers have. Transitioning to a New Release? 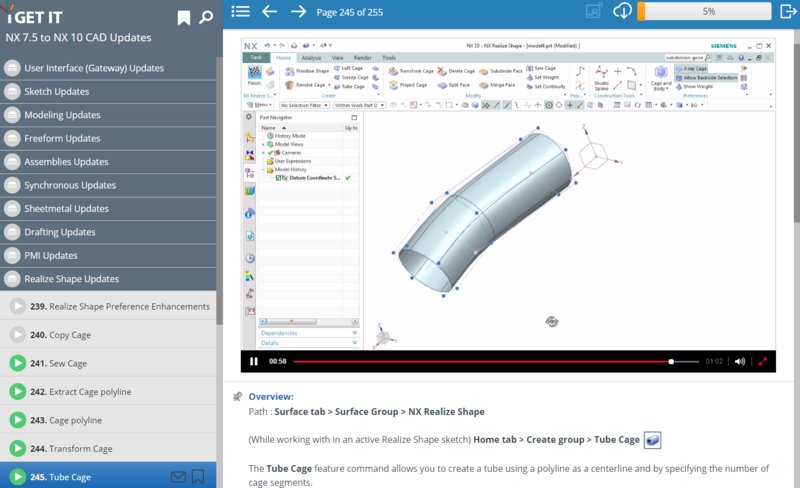 i GET IT Update courses will guide users through the latest changes, new features and techniques for your MCAD/PLM applications. We excel in offering transition training from earlier versions to the latest releases. Only using certain areas of your application? Want to add your specific processes to the courses? 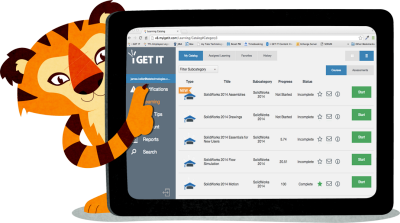 i GET IT provides full access for customers to edit and make changes to courses and assessments using our i GET IT Course and Assessment Builders. Tata Technologies, a global engineering solutions leader, delivers classroom training on-site or in our offices. Our subject matter experts can also work with you and develop customized training courses and plans. Need to Ramp Up New Users? Assign i GET IT New User Express and Essentials courses to make sure new employees are using the best and latest techniques for your applications. Assign i GET IT New User Express courses to make sure new employees are using the latest techniques for your applications. Tata Technologies, a global engineering solutions leader, delivers New User Express classroom training on-site or in our offices. Our subject matter experts can also work with you and develop customized training courses and plans. Do You Use More Than One MCAD/PLM Application? We cover all the major MCAD/PLM applications under one solution. Does Your Team Have the Supporting Industry Skills? Our courses make sure your engineers are on top of their game. Do You Know Your Teams Skills Gaps? Use i GET IT Skills Gap Analysis tools to assess your team and find areas of weakness. A detailed report allows customers to find gaps in skills and generate training courses specific to those needs. After running a Skills Gap Analysis, generate a remedial training plan that allows your team to focus on the weak areas. After the training, run another assessment to compare the improvements. Need an overall assessment for your PLM processes? Tata Technologies provides a PLM Benchmark tool that allows customers to find out how they can improve their overall PLM business. Provide students with training for CAD/PLM and Skills they will need when they enter the workforce. As part of Tata Technologies, we employ over 8,000 engineers and place resources to the largest manufacturing customers in the world. We understand what it takes to prepare people to be successful at work. Students can train at anytime and come better prepared to class, freeing teachers up for teaching other topics. Teachers can take advantage of our unique blended learning methods, allowing students to utililze our practice Try Its and Projects while in class. Customize courses and assessments to your needs and even create your own content using our i GET IT Course and Assessment Builders. As part of the Tata Technologies Ready Engineer Program, we see the need to invest in future engineers and offer affordable educational training plans. Send a request below and we will work to meet your needs. How Do You Ensure Your Best Practices Are Captured and Shared? With an aging workforce, can you afford your employees leaving and taking with them years of internal business knowledge? Tata Technologies understands thes issues and developed i GET IT to capture, deliver and report employees using your best practices and methods. With the i GET IT Course and Assessment Builders, customers can easily capture and build custom training, best practices and methods online. We can help you come up with a plan to capture and author your custom training and best practices using our i GET IT Authoring Tools. We have over 16-years of experience in helping customers with training and knowledge management. Would you like us to contact you regarding your training needs? Submit a request below and let us know any questions or additional information you need and we'll answer them.